• If you’re looking for the recording/slides for this webinar, please see our MDS Changes resource page. • We’ve scheduled a second live presentation of this webinar, Thursday, Aug. 3, 10:00am CDT. To register, click here. 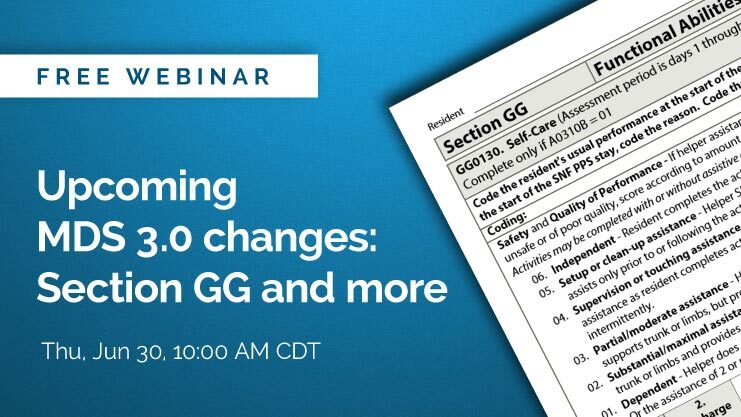 On June 30, SimpleLTC and Texas Medicaid Coalition hosted a free webinar covering upcoming Oct. 1 changes to the MDS 3.0 process, including Section GG, designed to help facilities assess the functional ability of a skilled resident at the time of admission and establish discharge goals, as well as a review of those goals at discharge. It also included information about the New Part A Discharge assessment and other updates to the RAI Manual and MDS 3.0 coding. Our special guest speaker was Shelly Nanney, State MDS Clinical Coordinator with the Texas Department of Aging and Disability Services. We’ve now made a recording of the webinar and slides available on our MDS Changes resources page. If you’d like to review the session content or share it with colleagues, you can find it here. Due to the overwhelming response to the first training session, we’ve scheduled a second live presentation of the webinar, which will be offered Aug. 3 at 10:00am Central Time. Please click here to register. Note that space is limited and our last session filled up fast, so please register soon. Shelly Nanney is the MDS Clinical Coordinator for the Texas Department of Aging and Disability Services (DADS). With 28 years’ experience as an RN in long-term care, she has worked in almost every capacity in nursing, from CNA to floor nurse, eventually becoming a DON and a Medicare Consultant, serving facilities in 5 states. Her passion is education and she believes that with knowledge, we empower our staff to improve the quality of lives for our residents. This webinar is presented by SimpleLTC and Texas Medicaid Coalition, and is free of charge for all attendees. The content is applicable to all SNFs and MDS personnel responsible for MDS accuracy and CMS compliance. Hi Wanda — We’re working on planning another webinar and will send out an email with more info soon. How do i register for this webinar? Is there available space? Hi Rodney — Unfortunately this webinar is full. We’re working on planning another session and will get the info out to everyone ASAP. HELLO JUST CHECKING IN TO SEE IF THERE WILL BE MORE SPACE AVAILABLE FOR THIS WEBINAR? This one is full but we’re working on scheduling another one. We’ll get that info out as soon as we have it. Has a new date been established for another webinar? Yes, we will offer a second webinar on Aug. 3 at 10am CT. Please look for an email about that soon. i registered for webinar and have not received a link to it yet?? I’m sorry you had trouble! The emails probably went to your spam folder. Please check there. When will PDF of this webinar be available? You can find the slides on our MDS changes resource page. Hi!! I attended the webinar this morning and I am trying to locate the slides for download. Can you direct me to them? Yes, you can find the slides on our MDS changes resource page. Thanks!